This entry was posted in enterprise architecture by Kris Meukens. Bookmark the permalink. I think this is a rather interesting and insight full coment into what architecture in a organizational or business context is all about. Adding structure and platforms to systems that otherwise would be chaotic. Nice post. You have hit on something here. While I believe I was right – that either the process or the product can be “agile” – it is definitely true that there is a correlation. An agile process is more likely to give rise to an agile product, and a non-agile process is more likely to give rise to a non-agile product. I believe that this is because of soemthing that we overlook too often in enterprise archtiecture – values. If you value agility (and those core aspects that underly the agile manifesto) then this will show itself in bothe process and the product that you design. And as you say this is even more likely when the product is the enterprise itself. Doug, I take another view on agility. I see agility as a property of dynamics, not of structures. So I agree that agile architecture is a process. But you can, in my view, not design an architecture that behaves agile by looking at the structure alone. Therefor you have to look to the dynamics, the behavior under different circumstances, of a system by performing simulations. You are absolutely right that agility is not a property of structures alone but dynamics as well. But stating otherwise was not what this post is about. 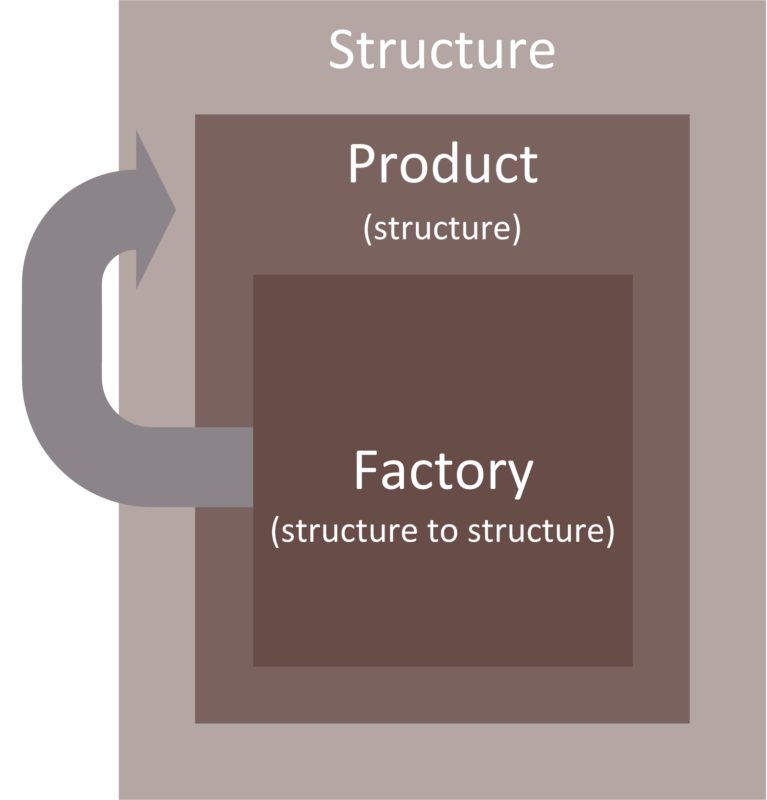 What I meant is that the act of developing structure, that I call factory, being agile or not, forms a system of its own, with its own structures. This system has hopefully strategy drivers but definitely operations as well as I have described in orders of agility. I also believe that agile development is more about operational agility than structural agility. But that some structure needs to exist as foundation to these agile operations is pretty obvious I think. I admit that I failed in drawing the full picture. I’ll elaborate more on this in the near future. First of all I’m curious if what you call the factory is the same asor similar to what I and SEI (at http://www.sei.cmu.edu/productlines/frame_report/what.is.a.PL.htm) call a product line (SEI uses it in a software context but I use it more general)? I like that statement very much (although I still feel that architecture is the prime enabler of plasticity) because I think that EA is too much preoccupied with the structure alone. Probably because it is looking too much at the way how buildings are designed or to urban design/planning. But enterprises, corporations, business or whatever name is appropriate are becoming more and more like living organisms which must react very quick to changing circumstances to be able to survive. And the way EA is done now is not able to cope with such fast changing situations. So I agree (because I think that is what you are saying) that the architecture process must become more agile but it also must deliver structures that are able to handle (or survive under) fast changing circumstances. Factory can be that but is not necessarily. In fact I am doubting if I should not use another term to avoid the confusion. I will need to think this over again and elaborate. Personally I find the metaphors of the brain or the organism in relation to the enterprise flawed. I am a supporter of Russell Ackoff’s system types definition that categorizes an organism as an animate system while an enterprise is a social system which is different. An introduction to that classification can be found in On the Mismatch between Systems and their Models. Thank you very much for the interesting pointer. This paper is an example of literature that seeks all salvation in embracing complexity, through embracing emergence in the form of self-organization, and by simultaneously rejecting the value of order (e.g. hierarchy). I believe that embracing complexity is very important and that self-organisation can add tremendous value but that one should not “throw out the baby with the bath water” with rejecting the value of order. With all the advantages that self-organisation provides, it also brings its disadvantages: unpredictability, unreliability, unrepeatability, hard to scale, etc. With only embracing complexity, one cannot build a viable and sustainable business. Successful business requires the realization of determinism. Any successful enterprise that gains value with applying self-organisation, has therefore also order in place. The most effective order is probably very much aligned with what self-organisation would result into, but is not the same. Just look at how even social animals like chimpanzees definitely have hierarchy in place. The hierarchy develops via self-organisation but once in place with the recognition of a distinct leader, becomes pretty rigid until it is challenged again by new self-organisation. Self-organisation is great for exploration but pretty poor for exploitation. Apple, the company that many like to admire because of its unprecedented success, has shown an impressive capability with regard to exploration but can hardly be called leaderless. So it is not one or the other, but both, self-organisation and hierarchy that are necessary: the former for exploration, the latter for exploitation / determinism. The brain methaphor is hardly complete in that regard because animated systems (in Russell Ackoff’s terminology) on their own are not deterministic and therefore highly unpredictable. Of course, as George E. P.Box’s “All models are wrong, but some are useful” learned us.